Broadway.com | Photo 1 of 20 | A Wild Birthday for Wicked! A Wild Birthday for Wicked! Producing pair: Hank Unger and Michael Rego. Wicked celebrated a year on Broadway with a week of activities culminating in the "Wicked Day" Block Party on October 30. 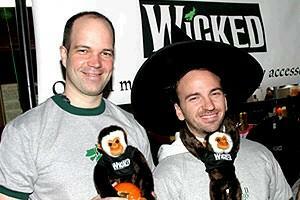 The wild and wonderful party had costumes, face-painting, games, food and the finals of the "Be Wicked" singing contest. Take a look at the many Elphabas, Glindas, Ozians and Wicked fans that showed up outside the Gershwin Theatre!